Not surprisingly, the idea was hatched over a couple of beers in late 1981 by three Badger loyalists at a campus bar. The three, Tom Grantham, Ken Sparks, and Rich Backus, wanted to raise money to support UW Athletics. As admirers of then- Athletic Director Elroy Hirsch, they asked his permission to name it the "Crazylegs Run" in his honor. The first race in 1982 attracted 1,525 runners and raised $9,500. The event grew in popularity and the walk was added in 1987 with 676 walkers the first year. The event has grown substantially reaching a record high of 20,415 in 2010. Since the inaugural race 37 years ago, it has attracted over 354,000 runners and walkers. 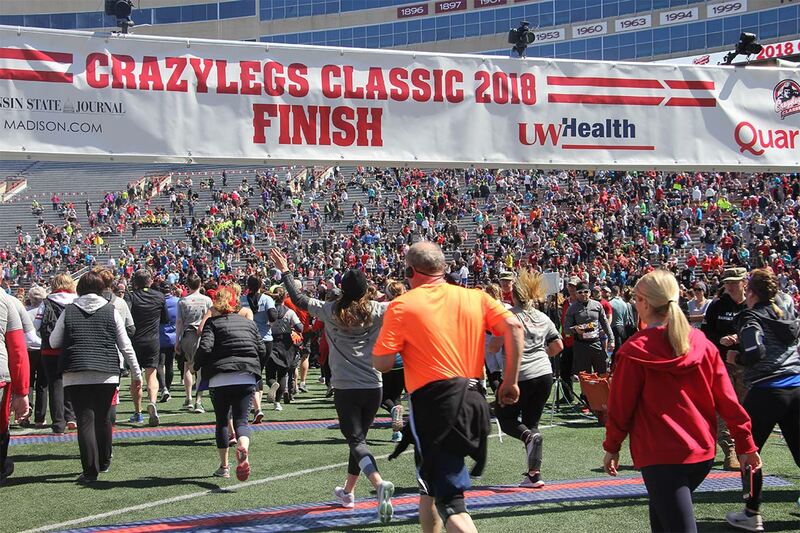 The Crazylegs Classic has become a time-honored tradition of the University of Wisconsin, as well as a much anticipated event to kickoff spring in the Madison community. **Prices do not include processing fees. Prices through 4/26/2019 at Midnight (CDT). Tuesday, April 16th – 4:00pm (CDT). Late team registrations are not accepted. What is a Fun & Fitness Team? 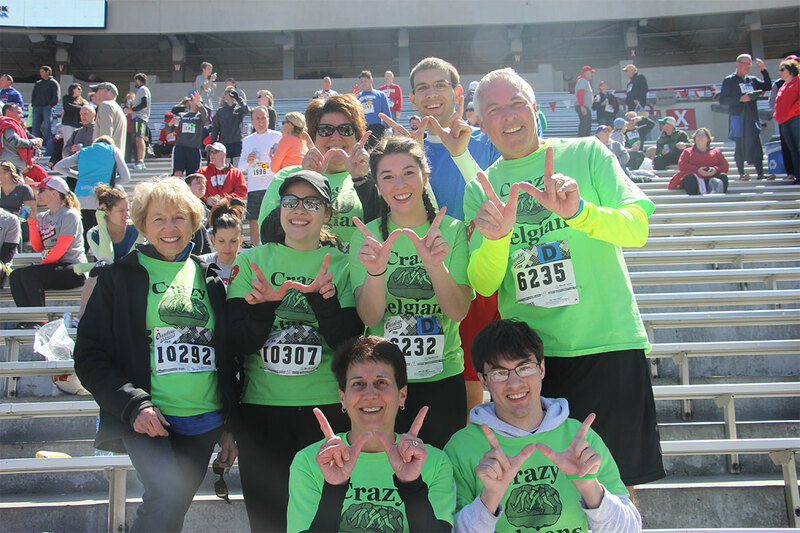 Any group, family, organization or business can form a team to participate in the 38th annual Crazylegs Classic. Forming a team offers a great opportunity to promote camaraderie, friendships, and overall health. 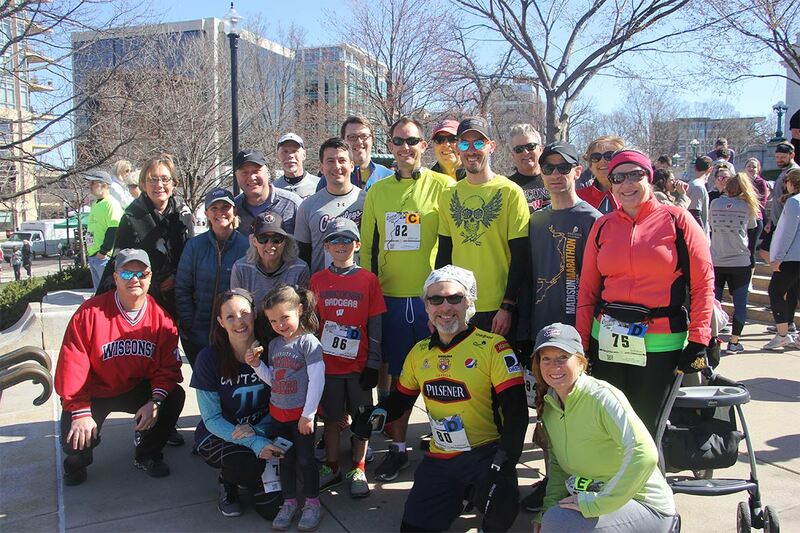 Team Packet pickup – convenience of team materials being available for your team captain or delegate to pick up on Tuesday, April 23rd from 10am – 6pm at the LaBahn Arena — (North Plaza). This bypasses packet pick–up by each individual team member. All registrants must be paid by Tuesday, April 16th – 4:00pm (CDT). No checks or drop offs accepted. Team Captain or designated member is responsible for picking up all team race gear. RUNNERS AND WALKERS will BOTH START on LIBRARY MALL at the intersection of State Street and N. Lake Street with staging on Library Mall along State Street and down Park Street. No registration or packet pick-up at the start. A grand FINISH on the field in Camp Randall Stadium. Finish where legends such as the legendary Elroy “Crazylegs” Hirsch (who the race is named after), Pat Richter, Ron Dayne, J.J. Watt, and Russell Wilson have played. For participants’ convenience, clear Crazylegs bags are provided at the packet pickup locations to put their sweats, etc. in. Reynolds Transfer & Storage, Inc. provides the sweat trucks at the starting areas near Library Mall and transports the bags over to Camp Randall Stadium. No personal bags or backpacks can be dropped off at the sweat truck. The last truck leaves the square at 10:40am. For sweats pickup at the stadium, follow signs to “SWEATS PICKUP” as you exit from the finish. WE ARE NOT RESPONSIBLE FOR LOST PERSONAL ITEMS. BAGS MUST BE MARKED ON THE OUTSIDE WITH YOUR BIB NUMBER AND WAVE (IF APPLICABLE) FOR IDENTIFICATION. All bags are subject to screening. 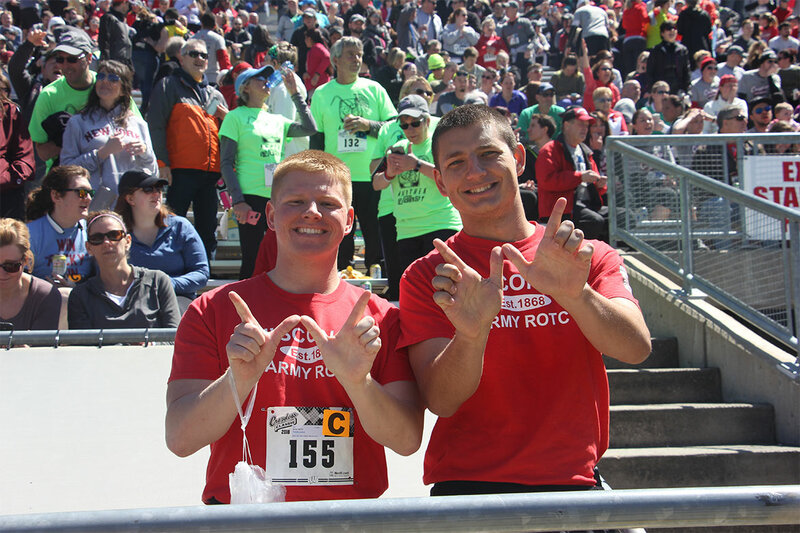 Event pictures will be taken by Empire Photography at both race starts on Library Mall and at the finish lines in Camp Randall Stadium and along the race courses, with the Grand Marshal and other race dignitaries for promotional and keepsake purposes. There are also photo opportunities with Bucky Badger, student-athletes, and the Bucky Wagon. 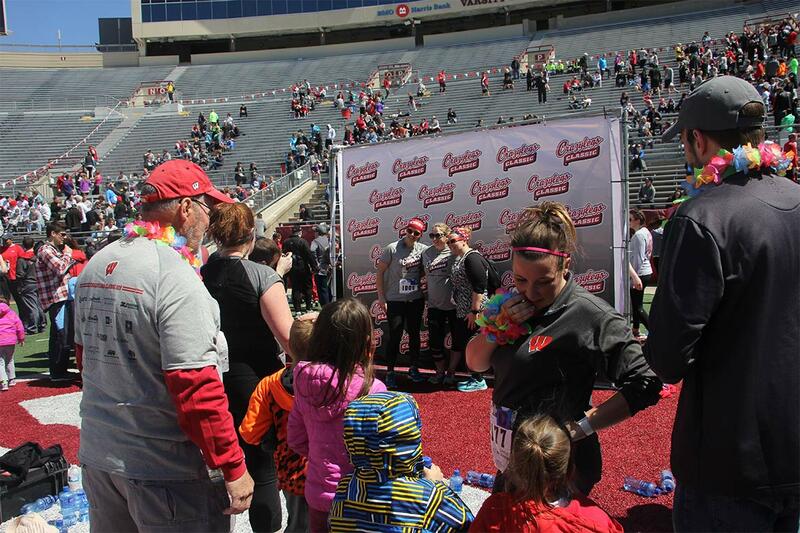 Capture your Crazylegs race memory! You will be notified by email when photos are available. Medical personnel are posted along the course and inside the Field House at the finish. If you need assistance look for the Course Marshals along the course. Paramedics will travel the course on bicycles. At the Stadium – go to Guest Services in the south end zone in the concourse or email [email protected] after the race. FREE race day shuttles to the starting line (drop off by the race staging area near Library Mall). Camp Randall Arch ONLY (Randall Avenue, Madison, WI), no shuttle service from the Kohl Center. *Please Note – NO Shuttles After 9:30am. The buses do not return to the square after the race so please plan your transportation accordingly. Be sure to review any street closures or construction detours on race day. A detour map will be available closer to race day. *Please note – depending on the day and time these lots will NOT be free. Click on the lot names below for a map or visit map.wisc.edu. Your race bib for the run must be worn on the outside of your clothing in order to be timed. No strollers or baby joggers are allowed in the run. Strollers, wagons and baby joggers are only allowed in the walk. Look for wave “Walkers with Accessories” at the walk start. No bicycles, unicycles, roller blades, Heelys, skateboards, or ripsticks. No pets allowed in the walk or run. Walkers are not allowed to walk the run course. Walkers use crosswalks and sidewalks. Any participant on the course after the NOON closure will need to move to the sidewalk, as all streets and intersections will re-open at that time. Obey race officials and yield to emergency vehicles. Devices that play music may be worn but please be aware of your surroundings. 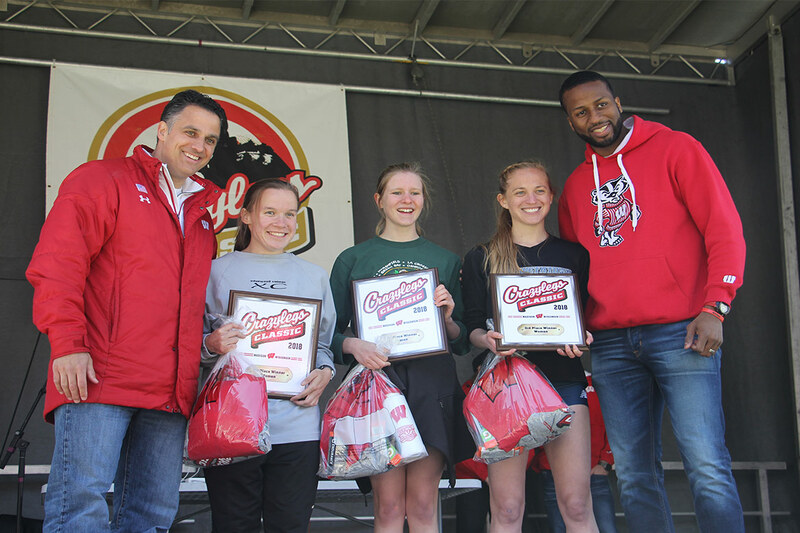 The Crazylegs Classic welcomes family and friends of Crazylegs participants. 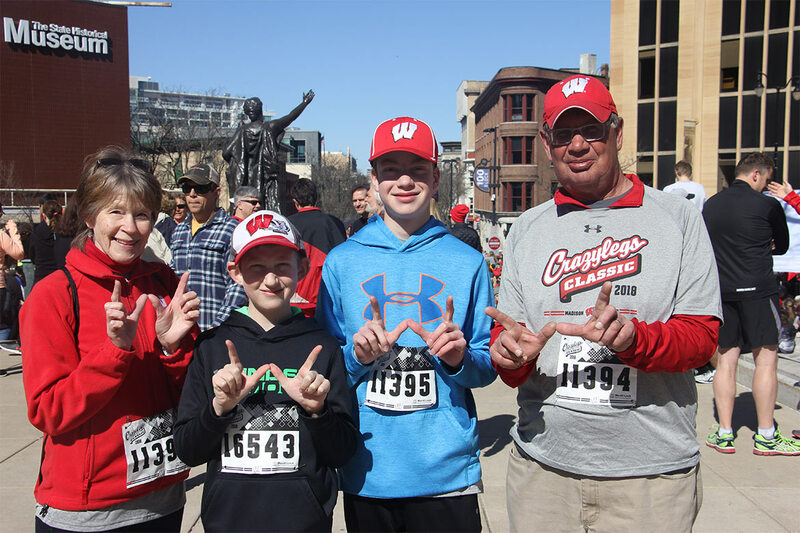 Spectators are allowed access to Camp Randall Stadium at 10:00 am to view the race finish and take part in the post-race festivities. Please follow appropriate signs for spectators. Important – spectators are not allowed on the field, so please plan your post-race meeting with race participants accordingly in a pre-determined section and row. As a service to Crazylegs Classic participants and spectators, we will have a STROLLER/BABY JOGGER CHECK AND PARK area located in front of Lot 17 on the north corner of Camp Randall Stadium, as these items are not allowed in the Stadium. This is a new location for 2019 due to the change in the walk course. We will also have a stroller parking area for spectators in Lot 19 at Gate 1. 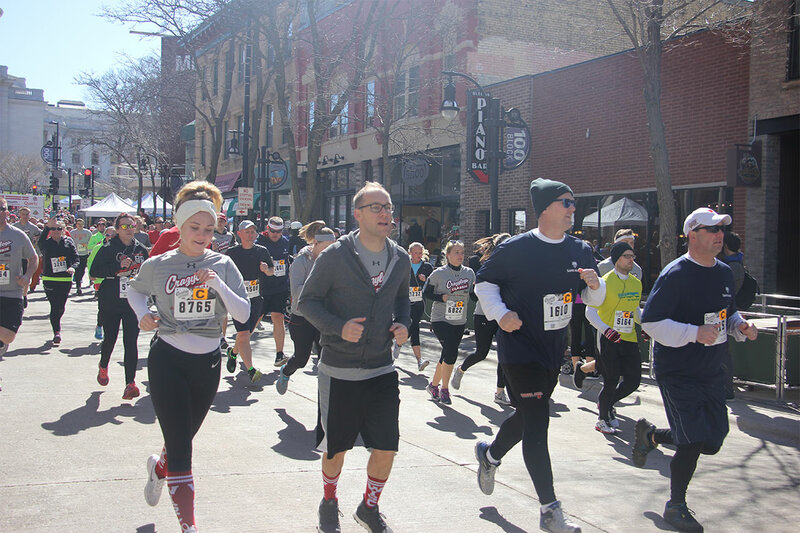 All strollers/baby joggers will be checked in and watched at all times by Crazylegs Classic staff so you may take part in the post-race festivities without worrying about accidents and injuries. They can then be picked after you exit the stadium. IMPORTANT: PLEASE REFER TO THE CARRY-IN POLICY FOR CAMP RANDALL STADIUM. Click Here to View The Carry-In Policy. Attention WIAA Athletes — WIAA High School Athletes, please check with your Coach on eligibility. Click here to see restrictions. Runners - Your race bib must be worn to be timed.The 8K Run will have a wave start which will be clearly marked as you arrive at Library Mall to help get you in place for the start. Please note the Run Start will now be on Library Mall at the intersection of State Street and N. Lake Street with staging along Library Mall and down Park Street. Look for wave signs and line up according to your assigned wave on your bib. Walkers - The 2 mile walk will start before the runners. There will be 'wave' markers for the walkers to line up behind. The waves are marked as "Speed Walkers", "Casual Walkers", or "Walkers with Accessories" for those with strollers, wagons, and baby joggers. Can I Still Run With My Friends? Absolutely. The wave start system is set up to allow you to run with your friends, family, coworkers, neighbors or the fellow runner you met just that morning. Any runner can move BACK in the waves. For example, if you are assigned to wave C and your friend is in wave F, you can simply line up in wave F at the start. Runners can only move back in waves, never forward. Plaques will be awarded to the overall top 3 male and female runners based on gun time. ©2019 Board of Regents of the University of Wisconsin System.